Israeli cybersecurity firms bagged a fifth of all venture capital investments in the domain in 2018, according to a new report. Only U.S. firms topped Israeli firms in terms of overall cybersecurity investments, according to the report by Start-Up Nation Central (SNC), a Tel Aviv-based non-profit organization managing a database of Israeli tech companies. 450 cybersecurity firms currently operate in Israel, the report published Monday states. Exports of cybersecurity technologies and products from Israel reached $5 billion, Prime Minister Benjamin Netanyahu said Tuesday. Israel is set on cutting red tape to make it easier to set up new companies in the domain, he said. 60 new cybersecurity companies were founded in the country in 2018, according to the report by SNC, a lower number than in previous years. 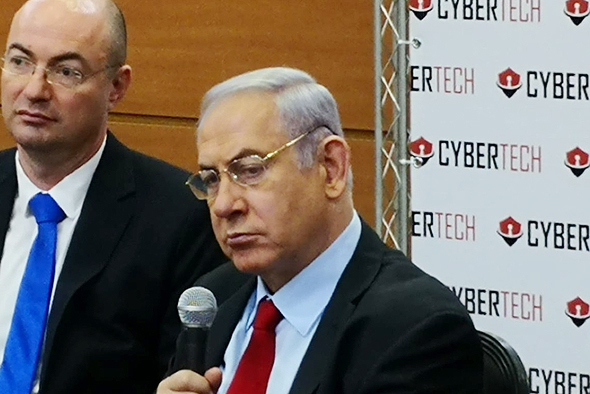 Netanyahu spoke at a cybersecurity conference in Tel Aviv Tuesday. Called CyberTech, the two-day event attracts private companies, nonprofit and governmental entities from around 80 countries. The event was also attended by Saulius Skvernelis, Prime Minister of the Republic of Lithuania, formerly the country’s Minister of Interior. Israeli cybersecurity companies raised a record $1.19 billion in 2018, up 47% from 2017, according to SNC. Deal size median rose from $3.5 million to $6 million in 2018. Non-Israeli investors, mostly from the U.S., participated in 65% of all the deals, according to the report published Monday. Only three investment transactions in exceeded the $50 million mark: private equity firm Vector Capital bought a 25% stake in KELA Group in April, according to a company valuation of $200 million, Claroty Ltd. announced it has raised a $60 million B series in June, and Exabeam Inc. announced it has closed a $50 million round in August.